In March of 2001, more than 100 of the top community leaders in Starkville and Oktibbeha County attended a press conference at the TVA office in Starkville. The press conference announced the hiring of the first CEO of a yet to be named community and economic development organization. This press conference marked the climax of an improbable story that began some two years before. The story goes that Jack Wallace, President of the Oktibbeha County Economic Development Authority, saw the need for the involvement of additional business leadership, and their resources, in economic development efforts. He approached Rex Buffington and Peggy Reed, the president and president-elect of the Starkville Area Chamber of Commerce, with the idea. They immediately jumped into action. An outside consultant was hired and a broad based “Vision 2005” committee was formed with OCH administrator Sonny Kelly as chairman. Included in the group were Wallace, nine other past chamber presidents, president of the Visitors and Convention Council Robin Fant, Portera, and ten other business leaders. They resolved that the fund-raising for these efforts would come only from the business and professional community – no public money. So the Greater Starkville Development Partnership was born. It included the Starkville Area Chamber of Commerce, Oktibbeha County Economic Development Authority, and the Starkville Visitors and Convention Council. Tommy Tomlinson was elected the first Chairman of the Board for the newly formed Partnership. The next big task was to find a building that would be the new home of the Partnership. After months of searching, the old People’s Bank building at 200 East Main Street in Downtown Starkville was selected. Each entity of the newly formed Partnership came together to fund and finance the Partnership’s new headquarters, which included a large-scale renovation, led by architect Briar Jones. Briar’s vision was that this building would be the living room of the community. A one stop shop where visitors, economic prospects, retirees, students, or residents of the Starkville community could come for assistance. The Partnership’s first capital campaign yielded $1.3 million over a 5-year period, setting the groundwork and financial stability for programs and initiatives to begin and expand. Since 2001, the Partnership has raised $4.3 million of local, private dollars, and I hope you’ll agree that the results have been well worth the investment. Just since 2010, tourism spending in Oktibbeha County has increased from $65 million annually, to over $93 million in 2015, realizing a 43% increase. This is during a time that many of our neighboring communities were rebuilding their tourism industries after a national recession. I’m very proud of the work that the Starkville Convention and Visitors Bureau has accomplished. Many of the events that now are woven in to the fabric of our community’s character and quality of life were created, implemented, and expanded by the CVB. These events include Pumpkinpalooza, our community’s fall festival, that has enjoyed exposure within national media and on ESPN, entertaining crowds of nearly 10,000 people each year; the Downtown Block Party, unWINE Downtown, Bulldog Brunch and Browse, the Holiday Bazaar, SOUPer Bowl, Starkville Restaurant Week, and the King Cotton Crawfish Boil, just to name a few. 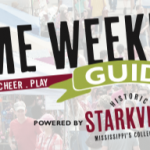 These events are just part of the package of an aggressive re-branding and marketing campaign that emerged after a Mississippi Main Street Association charrette was conducted in 2010 in the Starkville community. Out of this workshop came a renewed focus on promoting Starkville and positively shifting the perception of our beloved hometown. Mississippi’s College Town was Starkville’s new brand, and included a host of tourism-centered campaigns that have helped to further reinvigorate and revitalize Downtown Starkville, promote Starkville’s authentic and local culinary culture, while providing substantial economic impact to our restaurants and retailers city-wide. In 2010, the Starkville Main Street Association became a reality and became a new entity of the Greater Starkville Development Partnership. Now hailed as one of the top Main Street programs in the State of Mississippi, Starkville Main Street has been honored with numerous awards and has been invited to speak at regional and national conventions to share our strategies and successes for healthy revitalization and retail promotion of our Downtown. A strong success of the Main Street program has been the Starkville Community Market, our community’s certified local farmer’s market. Named the best Farmer’s Market in Mississippi by Mississippi Magazine, the Starkville Community Market has not only provided access to locally grown and made goods, but it has also acted as a business incubator, with at least 2 market vendors creating store front brick and mortar businesses based on their success at the market. In November of 2012, another monumental partnership was created when the GSDP, OCEDA, City of Starkville, and Oktibbeha County entered into a $350,000 annual regional economic development contract with the Golden Triangle Regional LINK. Oktibbeha joined Lowndes and Clay counties as the final partner in the tri-county economic development coalition. The LINK team currently represents Starkville and Oktibbeha County for industrial recruitment and expansion and is diligently working towards a successful acquisition of a new industrial park, to be owned by OCEDA. At our banquet 2 years ago, we unveiled a Strategic Plan for 2013-2015 that called for improving communication with stakeholders, sharing information and creating platforms by which the public can be informed, organizing and distributing an annual vision as it relates to policy, strengthening and expanding GSDP membership, providing an organized focus to promoting member businesses outside of the Downtown district, and continuing our strong focus on promoting commerce and improving the quality of life in Starkville.